Sage Cheshire, Inc., located in California's Antelope Valley, has over 40 years of experience in design, engineering, research & development and prototype or finished production of aircraft parts or full flight articles. Our team of highly qualified engineers and composite fabrication specialists provide services for many of the leading aerospace companies. From prototyping to one-off specialty fabrication to master-tooling to on/off-site testing of specialty components, Sage Cheshire is uniquely positioned at the nexus of next-generation aerospace vehicle development and production. Our experience with high-altitude ballooning makes our company the logical choice for those who need to do stratospheric research. We work with strategic balloon launch and recovery partners to provide no-hassle research solutions from US government agencies to educational institutions to private enterprise. Sage Cheshire Aerospace is proud to have been the prime contractor for the Red Bull Stratos mission. On Sunday, October 14, 2012, Sage Cheshire's purpose-built pressure capsule transported Felix Baumgartner to the edge of space, allowing him to perform the world's highest human free-fall to earth. Many records were set on and around this mission, from the breaking of the sound barrier during Felix's free-fall descent to the number of viewers live-streaming the event via the internet. What is it like to freefall through the airless void more than 100,000 feet above the Earth? Visitors to the recent Los Angeles County Air Show at Fox Field in Lancaster had the opportunity to find out from people who have done it. Speakers at one of several history panels included retired Air Force Col. Joseph W. Kittinger II, the first man to parachute from the stratosphere in 1960; Art Thompson, technical project director for the Red Bull Stratos project, in which Felix Baumgartner broke the speed of sound in freefall after jumping from 128,100 feet in 2012; and former Google senior vice president Alan Eustace, who set the record for the highest jump two years later after being carried aloft by a balloon to an altitude of 135,890 feet. Kittinger told the audience how he was only a young captain when was assigned in 1958 to the Escape Section of the Aeromedical Laboratory at Wright Air Development Center in Dayton, Ohio. There, he became test director for Project Excelsior, an investigation of the use of parachutes for escape from spacecraft or high-altitude aircraft. In November 1959, he traveled to New Mexico with a team of about a dozen Air Force researchers and began preparations for stratospheric balloon flights including high-altitude parachute jumps from above 63,000 feet, the altitude at which fluids in the human body begin to “boil” or vaporize at normal body temperature. He credited Air Force technician Francis Beaupré with solving the problem through the use of a multi-stage parachute system that featured a stabilizing drogue chute. It was the forerunner of the type of equipment used in emergency ejection systems for high-speed and high-altitude aircraft. “Today, every ejection seat in the world uses a small drogue chute for stabilization,” said Kittinger. On Nov. 16, 1959, he rode the Excelsior I balloon to 76,400 feet and jumped. His initial freefall was nearly flawless, but Kittinger’s stabilizer drogue deployed early and wrapped around his neck. He began to spin uncontrollably at 120 revolutions per minute and soon lost consciousness. Fortunately, his emergency parachute opened automatically at 10,000 feet, slowing his descent and saving his life. Despite this temporary setback, Kittinger made a second attempt with Excelsior II on Dec. 11. This time, he jumped from an altitude of 74,700 feet and fell approximately 55,000 feet before opening his chute. On Aug. 16, 1960, Kittinger ascended to 102,800 feet in Excelsior III, surpassing an altitude record set by Maj. David Simons, who had climbed to 101,516 feet in the Manhigh II balloon three years earlier. Floating above 99 percent of Earth’s atmosphere in temperatures as low as minus 94 degrees Fahrenheit, Kittinger was too occupied to savor his achievement. Loaded down with parachute gear and life-support equipment that nearly doubled his weight during the 90-minute ascent, he also endured severe pain in his right hand due to a leaking glove. This fact he kept to himself for fear the mission would be scrubbed before achieving peak altitude. Plummeting through the stratosphere for 13 seconds, he reached a maximum speed of around 614 miles per hour, or 0.91 Mach, just below the speed of sound. He slowed as the atmosphere became denser and felt a great sense of relief when his stabilizer chute deployed. Four and a half minutes later, a standard 28-foot parachute opened at about 17,500 feet, allowing him to float to a safe landing at White Sands Missile Range near Alamogordo, N.M. 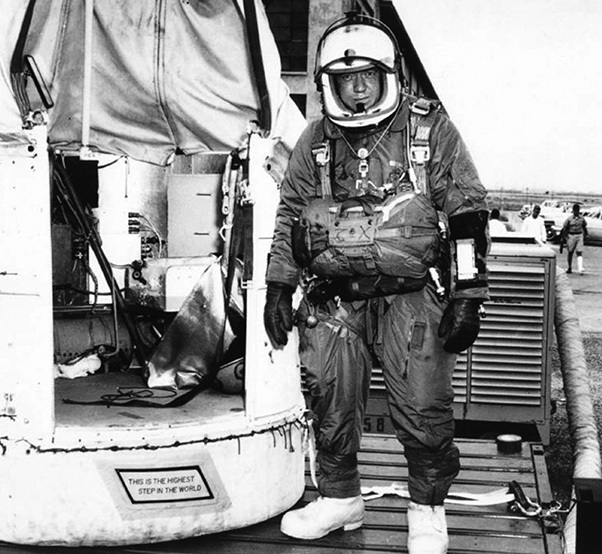 Although Kittinger was subsequently credited with three world records; the highest open-gondola balloon ascent, the longest freefall and the longest parachute descent, he emphasized that these milestones were merely an incidental byproduct of a military research project. More than half a century later, Kittinger assisted the Red Bull Stratos team’s successful bid to make an even higher jump, an effort spearheaded by engineer Art Thompson, who co-founded Sage Cheshire Aerospace, Inc., in Lancaster, Calif. During the recent panel discussion, Thompson described how he conceptualized and drove the design, engineering and fabrication of the flight vehicle, life support systems and flight-testing. He said the project was inspired by a phone call from Austrian skydiver and daredevil Felix Baumgartner in 2010, asking how he might break Kittinger’s records. The ensuing effort eventually received sponsorship from the Austrian company that makes Red Bull Energy Drink. The suit ultimately selected was essentially the same as that used by pilots flying the U-2 and SR-71 at altitudes above 70,000 feet. It was modified for greater mobility, which provided valuable lessons for use in the manufacture of future space suits. Additionally, the capsule was designed to maintain a cabin pressure equivalent to an altitude of 16,000 feet, or 1,600 feet lower than conditions experienced by climbers at Mt. Everest Base Camp in Nepal. Baumgartner would, therefore, not have to be exposed to the stratospheric environment until the last 10 minutes before jumping. To reach the upper stratosphere, Baumgartner rode in a helium-filled balloon made of 40 acres of ultrathin plastic no thicker than a typical dry cleaning bag. When fully inflated, it was as wide as a football field, making it the largest balloon in the world. As testing of the system progressed Baumgartner made two practice jumps from altitudes of 71,581 and 96,650 feet. He soon discovered that his greatest challenge was staving off an intense feeling of claustrophobia from being confined within his pressure suit during the long slow ascent. Additionally, according to Thompson, the Austrian was used to working alone and had some difficulty adjusting to a situation where he had to rely on his fellow team members. Finally, on Oct. 14, 2012, exactly 65 years after Chuck Yeager first broke the sound barrier flying in an experimental rocket powered airplane, Baumgartner ascended to a peak altitude of 128,100 feet. He depressurized his capsule, opened the hatch, and stepped out into space. Approximately 50 seconds later, he was at 91,316 feet and falling at a speed of 833.9 miles per hour, or Mach 1.24. He had become the first person to break the sound barrier without vehicular power. Additionally, he broke world records for highest freefall exit altitude and highest manned balloon flight, though he left the longest freefall record to project mentor Joe Kittinger. During his initial freefall, without a drogue, Baumgartner began to spin but quickly regained control. His speed caused a small sonic boom that he never felt, but which was heard on the ground. After deploying his parachute, he landed on his feet in the desert near Roswell, N.M.
Around the same time the Red Bull team was beginning their project, Alan Eustace conceived an idea to develop a self-contained commercial spacesuit that would allow human beings to explore high-altitude regions of Earth’s atmosphere as easily and safely as scuba divers explore the depths of the ocean. There was another difference, too. Unlike the Red Bull Stratos project, which was undertaken with a great deal of publicity before and during the event, Eustace and the StratEx team labored in utmost secrecy for almost three years and carried just two GoPro cameras to capture his jump. Eustace broke several records including national record for highest exit altitude, world and national records for freefall under a drogue chute, and national record for vertical speed. Additionally, with a top speed of 822 miles per hour, he became the second person to break the sound barrier outside an aircraft. Baumgartner still holds the records for vertical freefall distance without a drogue and vertical speed without a drogue. Art Thompson pointed out that more than three billion people viewed the Red Bull Stratos mission via television and streaming media. “It inspired many young people to consider careers in science and engineering,” he said. Full article and photos can be found on Aerotech News.